Docking your MacBook to a screen at your home or office gives the best compromise between portability and performance! I’ve been docking my MacBooks to monitors at my home office since my first MacBook Pro from 2010! So, why wouldn’t you? The MacBooks are fantastic little machines that can pack a punch while being so portable– but the 13″ or 15″ screen can leave one desiring more real estate to play with. So why not get the benefit of having a desktop setup with a laptop and bump up the performance while you’re at it with a SVALT Dock? It’s a pretty short and affordable list to get started with if you already have a MacBook. Basically, you hook the monitor to the adapter then the adapter to the MacBook while you have your wireless keyboard and mouse and power adapter hooked up and available. When that is all good, you can then shut the screen on the MacBook (hence clamshell) and place the MacBook on the dock! Not all docks are created equal! There are loads of different docks for you to put your MacBook on: basic stands ones from Twelve South to Henge Docks and others that can expand ports… many of which are super ugly. Docks typically elevate the computer into an upright position so that passive airflow can help cool the MacBook down (it is aluminum and does disperse heat after all). One thing that I noticed pretty early on with my personal MacBook Pro was the increased amount heat that the CPU/GPU generated in order to power the secondary display (or in my case, two Thunderbolt displays) in addition to the normal work and play I do in Photoshop and Lightroom (along with a good couple hours of StarCraft 2 and League of Legends). That heat created some interesting issues for me in the past, ranging from GPU failures to overheating the CPU which overall slowed down the whole the system. I went to the extent of cutting a hole in the backplate of my MacBook Pro so I could put a fan next to it while it was in a Twelve South Book Arc stand to try to cool it down a bit. It worked decently, but it sure wasn’t pretty. A wonderful and talented man named Chad Kirkpatrick in Oregon, who is SVALT’s CEO and is a photographer as well, hit the drawing board to address these issues that most mobile professional graphic artists, photographers, and videographers face when they dock their systems to monitors. He ended up coming up with a beautiful American made slab of aluminum with a built-in fan that not only displays the laptop in a beautiful manner but allows access to the power button and cools the GPU and CPU directly to keep temperatures down and performance up! Not only that, he’s put a lot of studying, benchmarking, and research into developing this dock so that it’ll perform! Oh, and if you didn’t notice, it also matches the MacBook’s aluminum shell perfectly. He calls this the SVALT Cooling Dock. It comes in a couple flavors. The D1 is a simple dock that has a fan that you can turn on and off. The D2 is a smart dock, one could say. It features an adjustable fan that spins at varying speeds that you can adjust on demand using a button on the rear, or you can let it do its smart thing with the built-in temperature sensor that triggers the fan to spin faster when the MacBook gets hotter! It’s freakin fantastic! CPU’s and humans share a common trait, that is: when at work, heat is generated. Intense processing, like video editing/rendering, file exporting, converting, compiling and other processes of the sort, make all the cores of the CPU work! If that heat doesn’t stay in check, then we end up having issues that may slow down performance or even cause failure to our machines altogether. One way we can keep the performance up on our machines is to keep them cool! 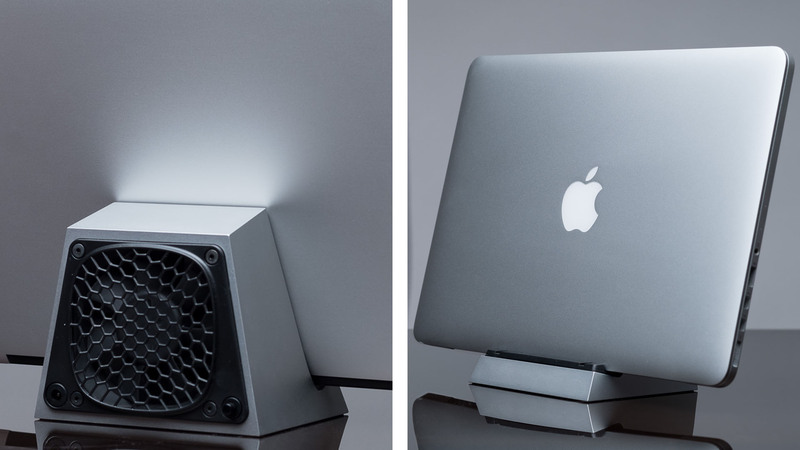 There hasn’t been a dock that is as cool and can actively cool the MacBook like SVALT’s Cooling Dock. This dock has a fan built into the back of it that funnels air into the vents of the MacBook to move the air that is directly over the CPU and GPU, which is normally just stagnant. This air movement combined with the normal heat sinks dramatically decrease the temperature of the CPU, allowing Intel Turbo Boost on the MacBooks to run at max speed when needed! Turbo Boost is an automated feature of Intel i5, i7 and i9 series processors. It will scale up the speed of a processor to unlock more performance when the workload calls for it. When it doesn’t need all that extra performance, it’ll slow down to the base clock speed to save power and cool down. It’s pretty smart and quite complex! Thankfully we don’t have to worry about too much since it does all the speeding up and slowing down all on its own. How many cores the workload needs. When the processor is below the TDP and thermal limits of the processor, the speed of the processor can exceed the base clock speed, which we call TURBO!! Each model of CPU in every model of MacBook, or other laptop, will end up having a specific TDP and thermal limit. How much potential speed that the Turbo Boost will give you is typically listed in the specifications of the laptop for that model of CPU. Both dual core and quad core processors end up having different levels of Turbo depending on how hot the CPU gets. Because quad-core processors are quicker to generate heat and reach their thermal limits than dual-core processors, the potential for a quad-core processor running at full Turbo is already diminished. When a CPU slows down because of the heat, it is called throttling, and that’s exactly what we want to avoid! Now, imagine avoiding throttling all the time! Without having to worry about the thermal limits of the processor, the CPU can use Turbo Boost for as long as it is needed! So, does the SVALT Cooling Dock work? Absolutely! I did a 1080p video encode twice with HandBrake and had watched Intel’s Power Gadget, which monitors Turbo Boost/CPU frequency and temperature for a run with the dock and without the dock. Without the Dock turned on, I watched the temperature climb, hit the limit for the CPU on my base model 2013 MacBook Retina, and stay there. The frequency graph showed the CPU hitting Max Turbo for the first 3 minutes before slowing down about 13% on my specific model. The SVALT Dock has some really good gains for a 15″ MacBook Pro– those quad-core processors heat up and can benefit from the active cooling quite a bit! I tried it on my friend’s base model 2012 MacBook Pro Retina for some Geekbench testing– I ended up scoring 19% higher compared to his base score. I absolutely would recommend having one of these if you tend to dock your MacBook Pro. It is absolutely pretty, pushes the performance of the MacBook Pro, and is made for the professional– photographer and videographer. Check out SVALT’s performance page shows a lot of testing that Chad has done on his own. Pick one up at the SVALT website! This article is a shameless plug for something that quite honestly is patently NOT a dock, in any way, shape or form. Its merely a stand. If you want to write an article about MacBook Docks take a look at HengeDocks – a real Mac docking station. It’s not a plug, it’s a favorable review. It holds a Macbook and allows it to work better with other devices it’s docked to…which sure sounds like a dock to me. It’d be sweet if it also had more USB inputs built in, but then it wouldn’t be as pretty.